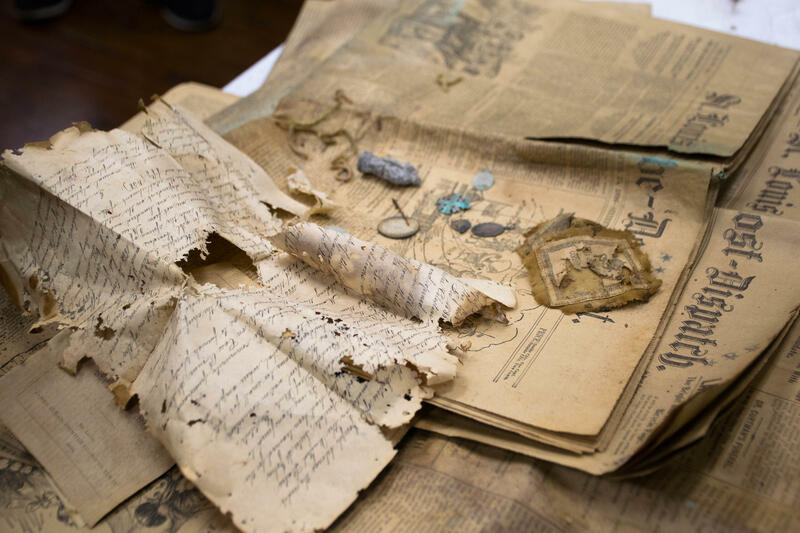 Historical papers and religious items dated back to 1896 filled the time capsule found under the Chapel of Our Lady of Good Counsel. A hobby preservationist cracked open a time capsule from 1896 this morning to find a well-preserved collection of Catholic religious items and historic papers. Jim Meiners found the copper box in the foundation of the Chapel of Our Lady of Good Counsel, which was demolished with the Clemens House after the property caught fire last year. “It would’ve been put there when the building was built, and we don’t know what’s in it,” he said before cutting into the lead seal on the box. The Clemens House property on Cass Avenue in north St. Louis. The Sisters of St. Joseph used the Clemens House on Cass Avenue in north St. Louis as a convent for more than 60 years after purchasing the property in 1885. 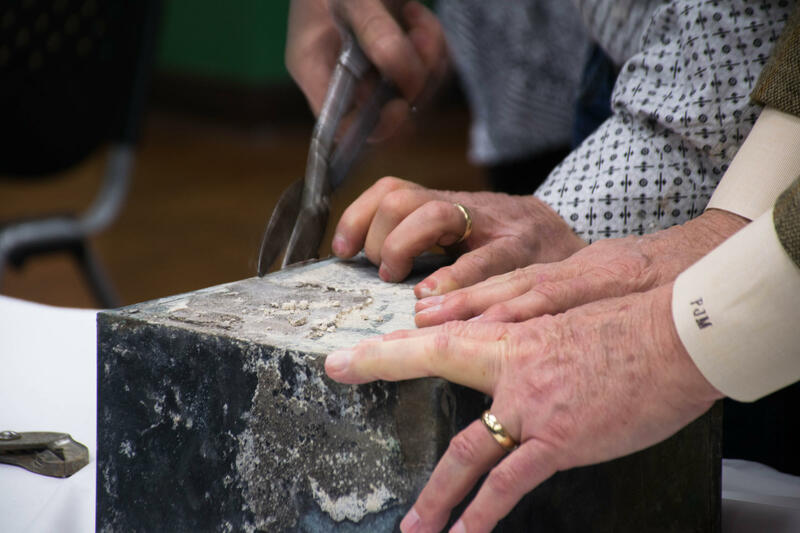 They expanded the house, then had the chapel built in 1896; that’s likely when they inserted the time capsule into the foundation’s mortar for future generations to discover. “We have a lot of wonderful stories about living there, being there, the early days. This will be another piece of our history that we can archive,” said Sister Marilyn Lott of the modern Sisters of St. Joseph of Carondelet, who explained the items' significance as they emerged from the box. The sisters had no record that a time capsule had been hidden in the chapel, so they were surprised to discover it contained pamphlets with the bylaws of the Ephpheta Society — an order that the sisters say helped teach deaf people and inspired the sisters’ work. It also contained a letter that their predecessors wrote to the Archbishop Peter Richard Kenrick, who was the first Catholic of his station west of the Mississippi. The box had a coin; a Jerusalem cross and other religious medals; a large medallion dedicated to Kenrick’s 50th anniversary as archbishop; a statue of St. Joseph and other devotional objects. Several newspapers dated April 25, 1896 were also included. Lott said she loved watching history unfold. “Oh, my gosh, it gave me chills,” she said. Two sisters who lived at the convent during the twentieth century attended the ceremony. The Clemens House was built by Mark Twain’s uncle in 1860. The nuns bought the house from him, then sold it to another Catholic group in 1949. 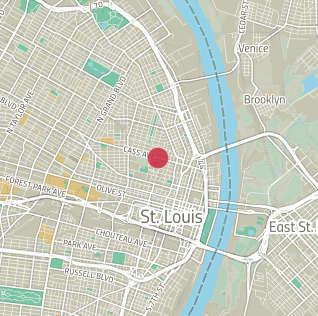 The property has been controversial, as it is located in Paul McKee's 1,500-acre Northside Regeneration development, which received more than $40 million in state tax incentives and a $400-million Tax Increment Financing package from the city of St. Louis. McKee had promised to rehab the mansion, first with a $13 million plan for a senior living facility, but that did not come to pass. 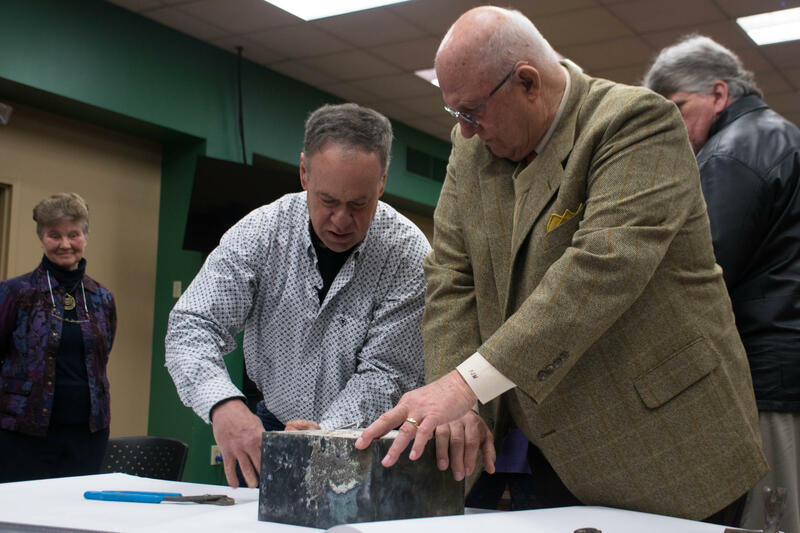 Hobby preservationist Jim Meiners (left) and developer Paul McKee work together to open the time capsule. Preservationists and area residents said little was done to protect the property, and a fire destroyed the structures in July 2017. The chapel and mansion were both demolished after preservationists salvaged elements of the buildings. The Sisters of St. Joseph will receive the items. They say they plan to clean then archive them.